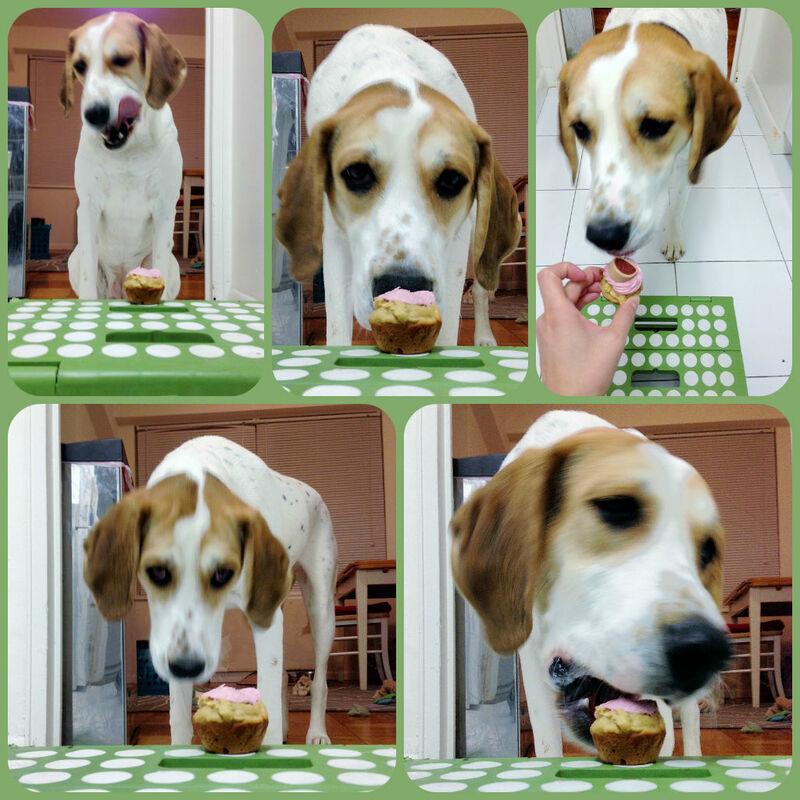 I never expected that I would be one of those people who obsessed over their puppy and make pupcakes for their puppy’s birthday. But there I was, over the weekend, vacuuming my apartment thanks to all my puppy’s fur, about to burst with excitement, thinking about what I was going to do for my baby’s birthday. Now, it is strange to think that she has absolutely no idea that today is not a day like any other. She is just going on living her merry life of sleep, play, eat, per usual. But, for me, it is a very special day, and I wanted to share my joy with her. 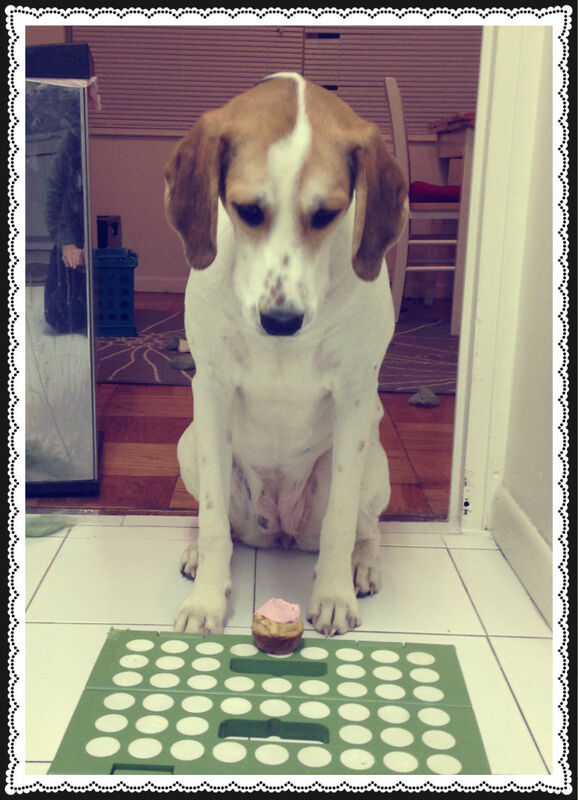 So, in honor of Daisy’s first birthday, I made Pup Cakes! 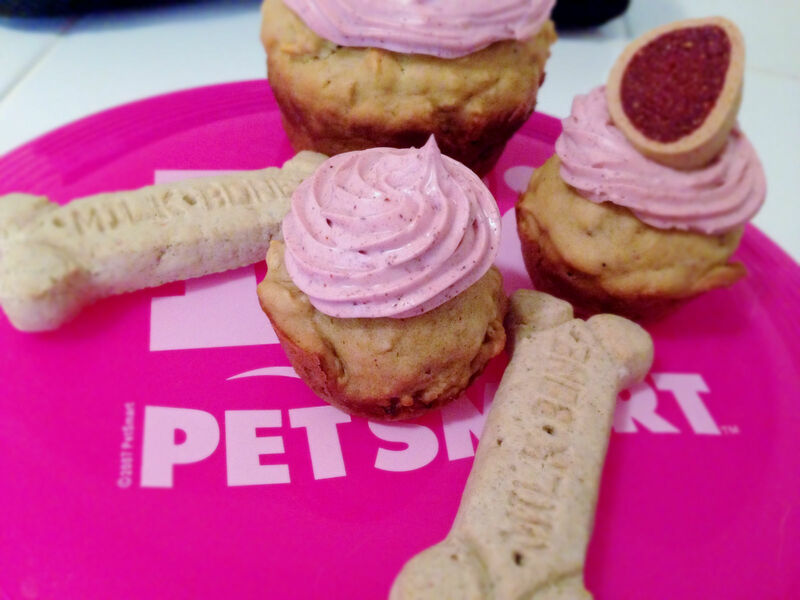 Yes – PUP cakes! Also known as, cupcakes for puppies! Or dogs…Or humans, I suppose; if you like that sort of thing (I suggest leaving off the bacon treat if you decide to have a taste, though). The recipe: I shopped around the internet for various recipes, using Pinterest as my hub. If you’re interested, you can check out some of the recipes that caught my eye on my It’s a Dog’s Life page. Then, after gathering sufficient knowledge of typical ingredients in puppy snacks, I went to my kitchen and threw a bunch of ingredients I had on hand in a bowl and stirred. 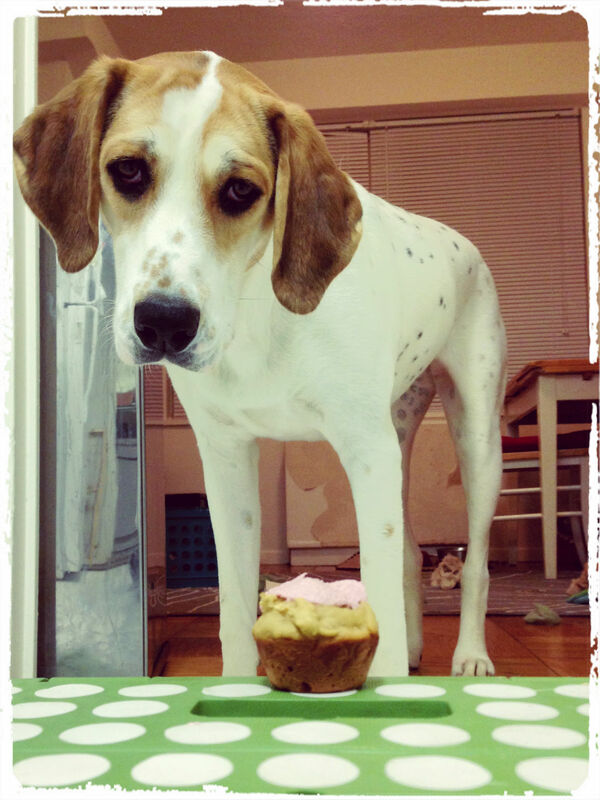 (She is a silly puppy who will eat anything, after all – not Florian Bellanger or Candace Nelson, the oh-so-talented-and-critical judges on Cupcake Wars. Daisy will eat almost anything…except bananas…she does not understand bananas.) My two ingredient requirements were peanut butter and bacon. I cannot think of a better puppy combination, can you? Now, that being said, when I got home from the gym last night, I realized I did not have bacon. 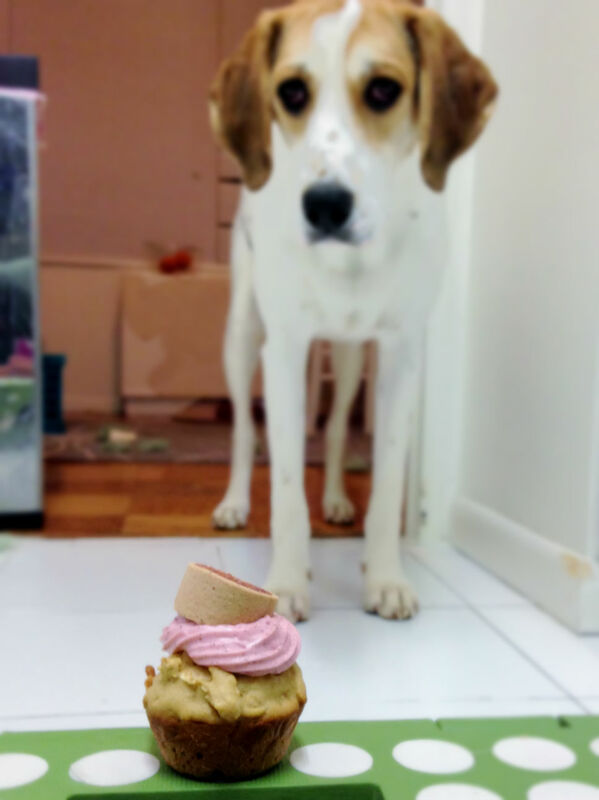 I flirted with the idea of going back out to the grocery store for the sole purpose of buying bacon to put in my puppy’s birthday pup cakes, but even I have my limits when it comes to my baking and puppy obsessions. Besides, I had an idea: I had turkey sandwich meat, and oil. I don’t know how much of a likeness this bares to bacon, but I chopped up and fried these slices and threw them in the batter at the end. Daisy was all up in my business when I started frying that stuff, so I knew it would be a hit. (I had to banish her from the kitchen!) Once they were baked, I let them cool, mixed up the frosting, and threw on come chewy bacon dog treats for good measure. Daisy was in puppy heaven. And I was a very pleased puppy mommy. 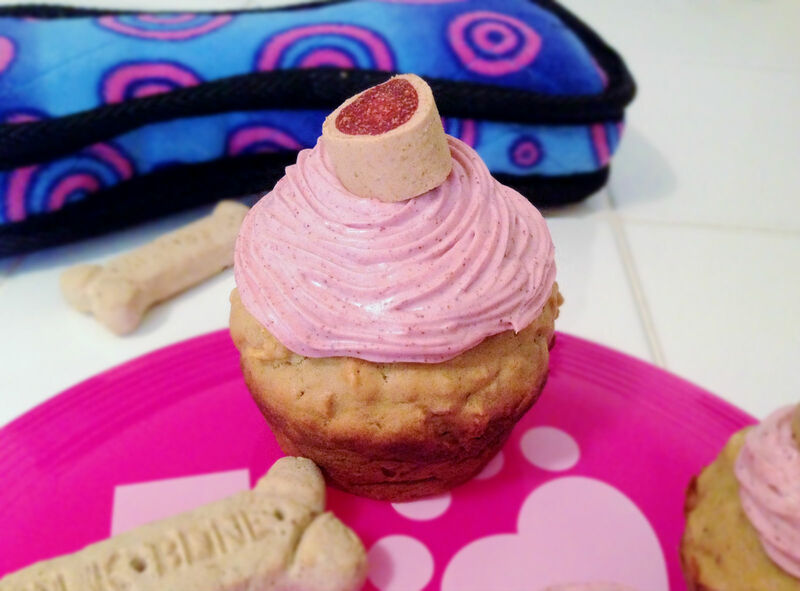 These pupcakes are extremely simple and actually not half bad (yes, I tried them – how could I not try my own creation!?!? I was curious!). Plus, I knew what every ingredient was, so I knew there was nothing sketchy or unappetizing in them, and they are pretty healthy, because there is no sugar or butter. I was actually thinking I could pretty easily modify this recipe to make a very healthy very yummy human snack. My mom has been hounding me to make her “healthy cupcakes” (oxymoron much?) for awhile now, so maybe I will finally experiment with that. 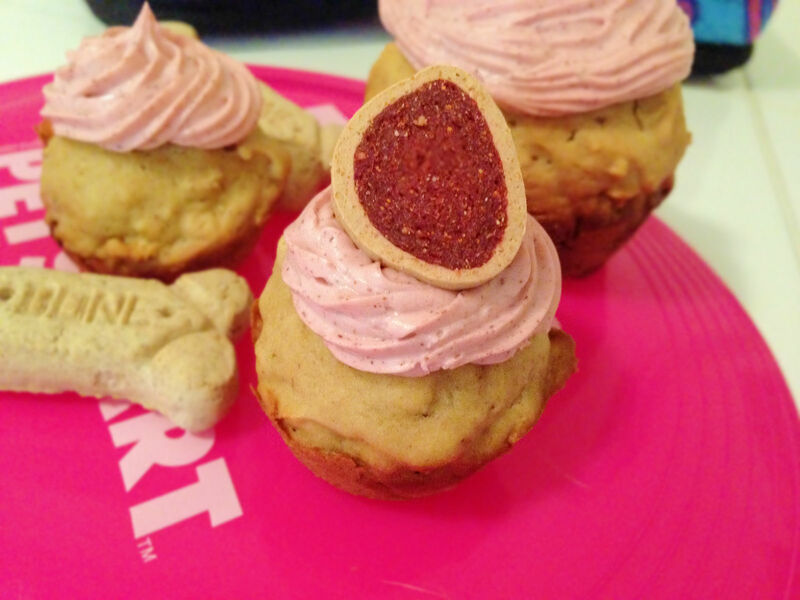 There is plenty of wiggle room in this recipe, so go crazy and put in your pup’s favorite! Blueberries? Great, and full of antioxidants! Parsley? Help freshen their breath! Cheese? Let’s be real, what self-respecting dog doesn’t go wild for cheese? 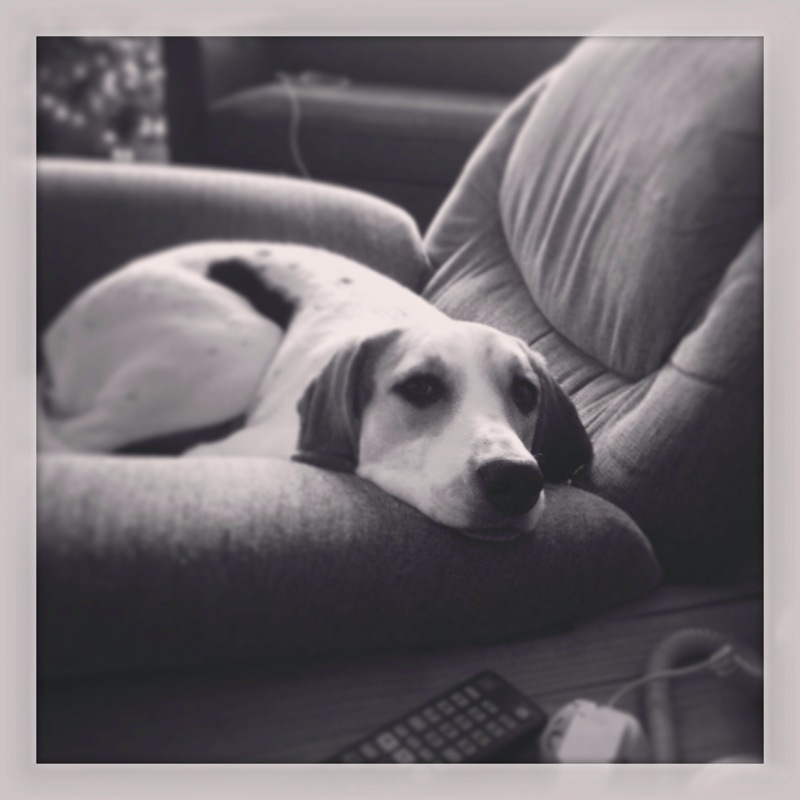 What do you have in your pantry that your dog loves?!?! Get creative! I hope your puppy enjoys this treat as much as mine did! Preheat oven to 350F. In a large bowl, mix together dry ingredients. Add wet ingredients to the dry and mix well. 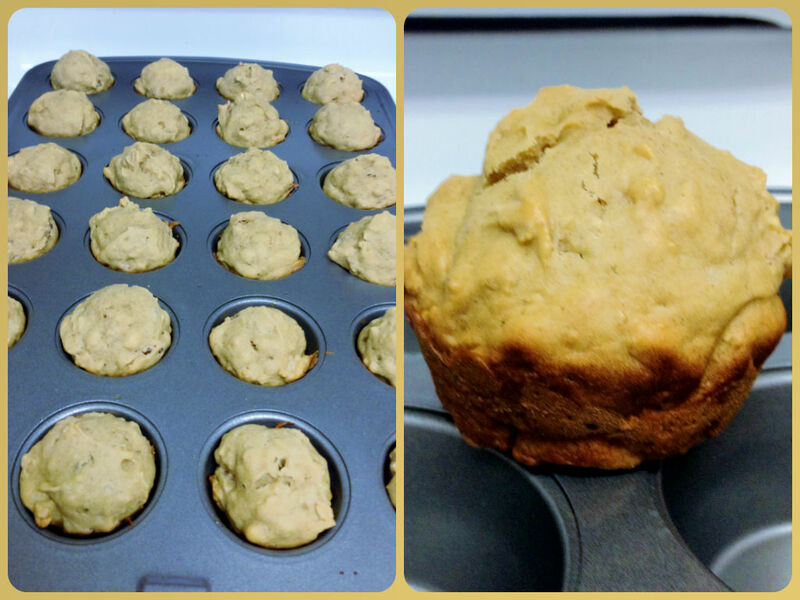 Put batter into muffin pan and bake for 8 to 15 minutes, depending on size. Mix all ingredients until combined. 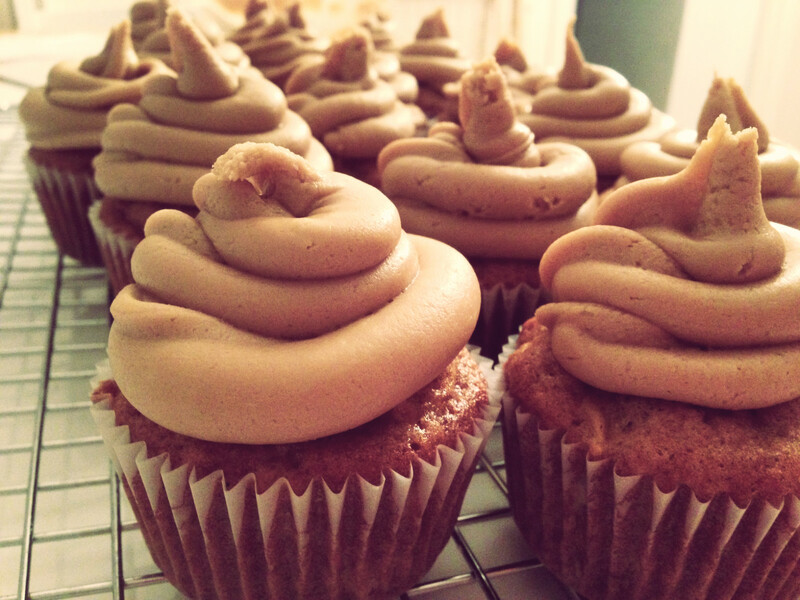 Once cupcakes are cooled, ice with frosting. Hello friends! 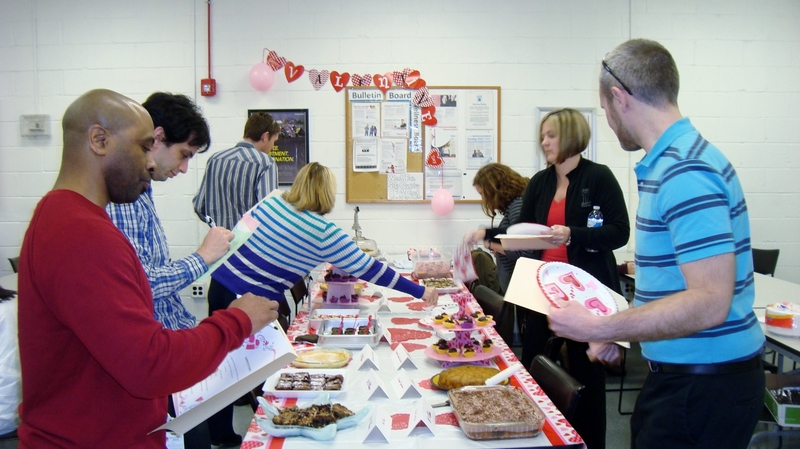 This Tuesday at work, we had our annual Valentine’s Day Bake-Off. (It was supposed to be on Valentine’s Day, but the giant snow storm delayed it.) 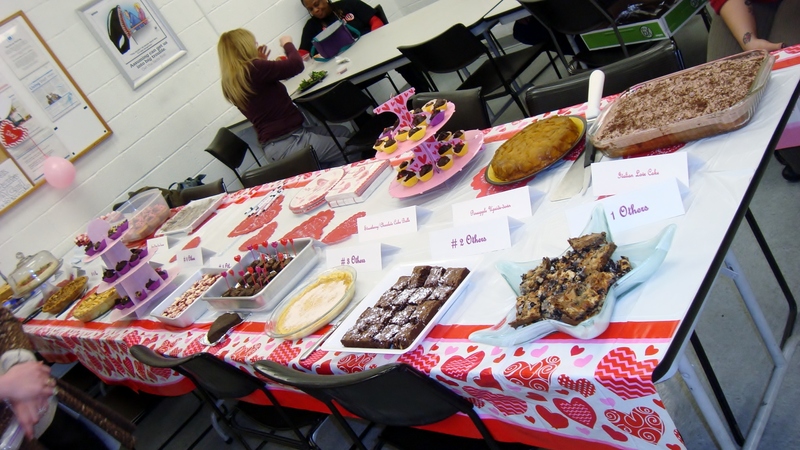 There were four categories: Pies, Cakes, Cupcakes/Cookies, and Other. Now, while I am not sure I agree with the breakdown of the categories (Cupcakes with cookies!?!?! What is up with that!?!? ), the competition was great and all the participants had a great time. Some really went all out with crazy things such as multi-tier displays and mood lighting! These Strawberry/Chocolate Cake Balls had a two-tier pink cardboard display. Genius! I didn’t even know disposal displays like that existed! 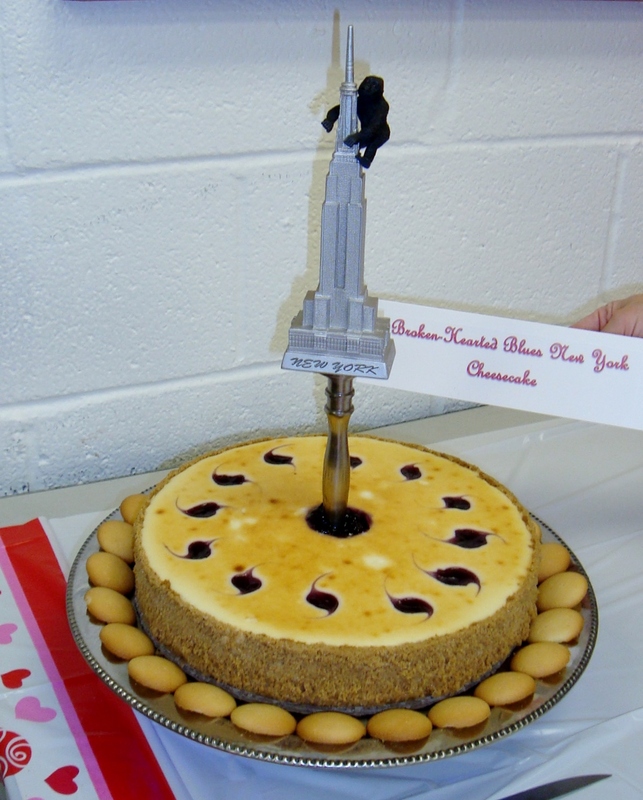 This Broken-Hearted Blues New York Cheesecake was the most intense display – It had blue mood lighting underneath the tray and a mini Empire State Building with King Kong coming out of the middle! It won the Pies category. (According to Food Network, cheesecakes are pies because they have a crust.) It didn’t need all that though, because it was a darn good cheesecake anyway! 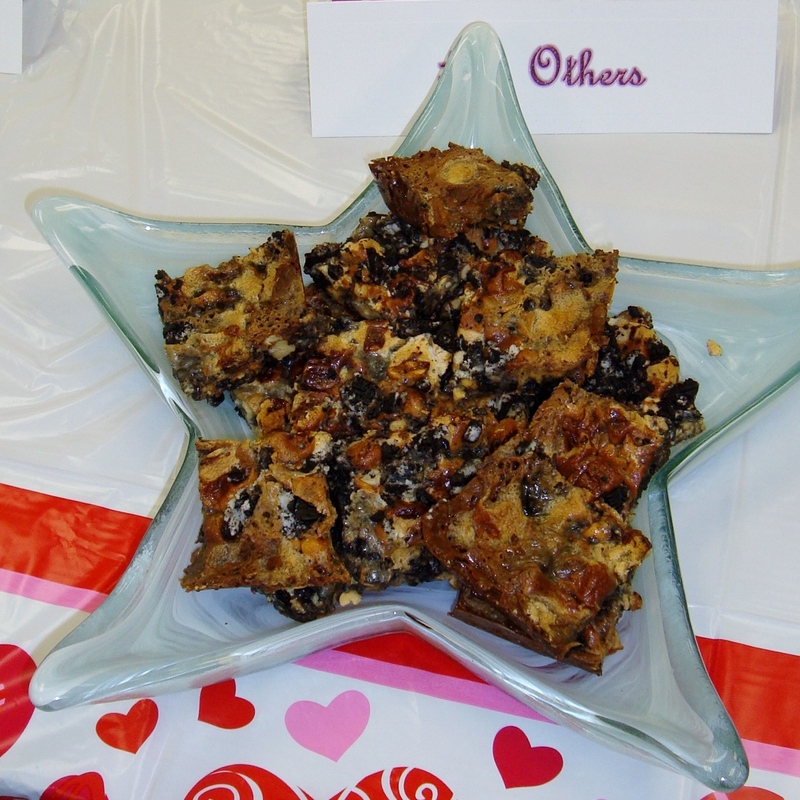 The display for these Oreo Bars was less intense, but the pretty dish was still a huge step up from my cupcake carrier and square cake pan that I used as the vessels to distribute my treats! 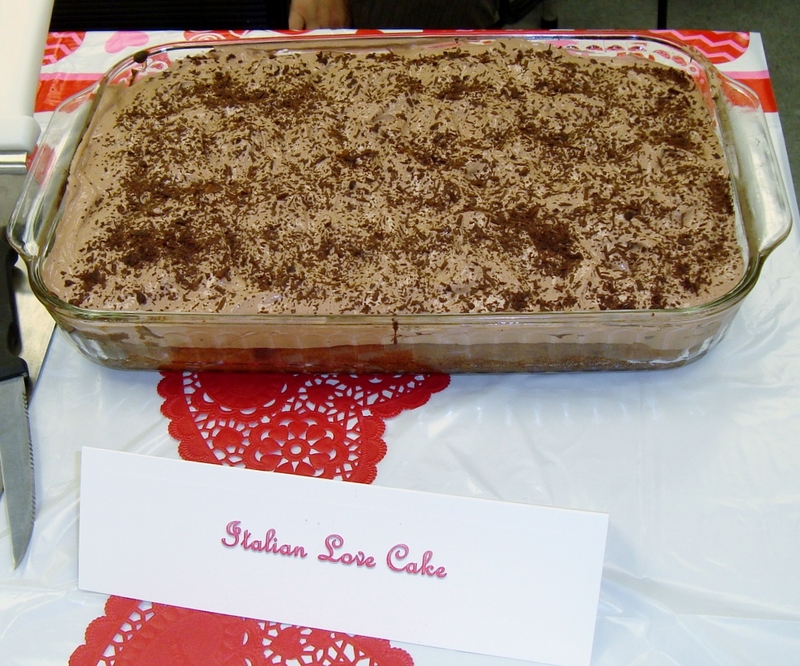 This Italian Love Cake was the winner for the Cakes category. It was so chocolaty and delicious! I LOVED it! It lacked the fancy display, like mine, but its chocolaty goodness was too much to resist. Congratulations Diana! 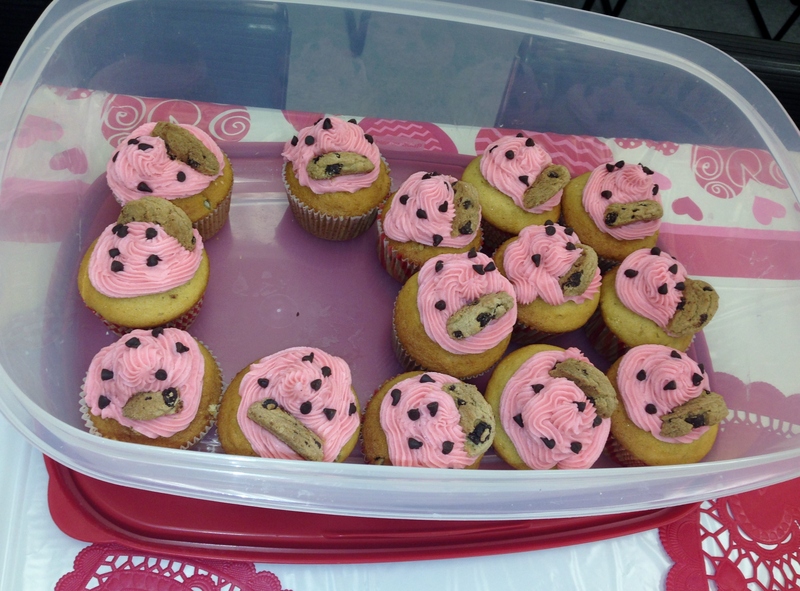 Chocolate Chip Cookie Dough Cupcakes…A formidable competitor that also did not focus on the display aspect, but was nice and pink for V-Day. I’m not exactly sure what all the judging criteria was, but I know it consisted of taste, flavor (apparently there is a difference! ), appearance, impression, presentation, creativity, and relevance to the theme. I got a look at the score cards and they were intense – a full page for each submission with all the different criteria. Each judge had a whole folder worth of material to fill out. No wonder it took them almost an hour to get through the judging! All the submissions…ready to be devoured! I decided to go big this year and enter two categories: Other and Cupcakes/Cookies. 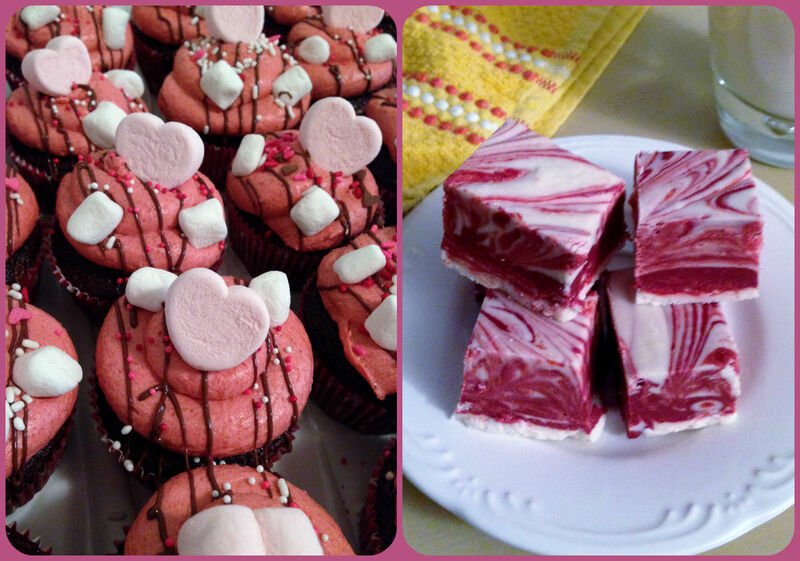 I made Red Velvet White Chocolate Peanut Butter Swirl Fudge and S’mores Cupcakes. And…drumroll please…I won both categories! Now, while I missed the memo that the way you display your treats affects your score, I guess my flavors were good enough to win anyways. 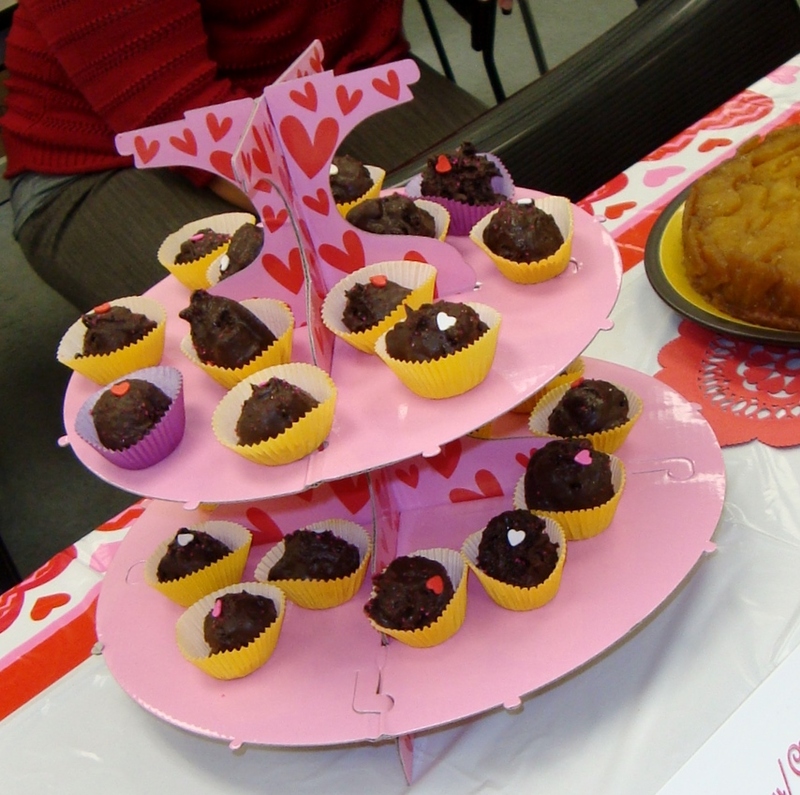 Plus, I did decorate my cupcakes Valentine’s Day themed, and the fudge was red and white swirls. When they announced the winners, I had actually already left the Bake-Off to go our weekly R&D meeting. My coworker Kale (who ditched the meeting entirely!) comes into the room about 10 minutes after it started and says, “Stephanie, you won for the Cupcakes AND the Fudge!” I was like, “Really?!?! No, really!?! ?” I continued this same ‘discussion’ several times as I followed him out of the room and back down the hall to the Bake-Off. Honestly, I wasn’t sure I would win ONE, let alone BOTH categories! Plus, Kale loves messing with me, so I wasn’t convinced I had really won. 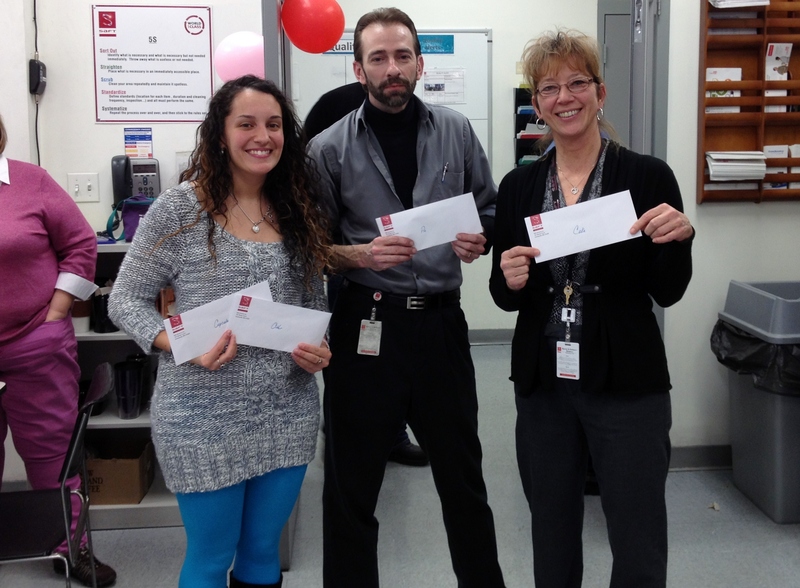 I scolded him and was like, “If you are psyching me out, that is really mean and I am going to be so mad at you!” He assured me he wasn’t, and, upon reentering the Bake-Off, I was handed not one, but TWO prize envelopes! It made my day, of course! I try not to brag too much – 1, because it is annoying, and, 2, because I am so not over-confident in my baking skills, or life skills for that matter! – but I have to share this very exciting news because I am really proud of myself. Last Valentine’s Day, my pink macarons fell short of expectations and did not win anything in the Valentine’s Day Bake-Off, to my slight disappointment (they are very hard to make!). I understood though, because I took one bite of the lime cupcakes that beat me and I knew I was defeated. Last spring, this blog was born and I promised myself to bake regularly to practice and improve my baking skills. The goal of improving my skills was not to win the Bake-Off this year, but to improve on my new love for baking and get better at something that really makes me happy. I may have peaked years ago in my super-soccer skills – which is something else I love – but baking is something with which I am pretty sure I have yet to reach my prime. Winning both categories I entered for the Bake-Off this year is really just the icing on top of the cupcake for me (hehe), and more of a validation and confirmation of my year of baking and practicing and improving. The prize was $75 per catergory, so that is $150 more in my pocket! My year of baking has paid off – literally! Now, I am going to write a post this weekend with the fudge recipe, so be on the lookout for that one! 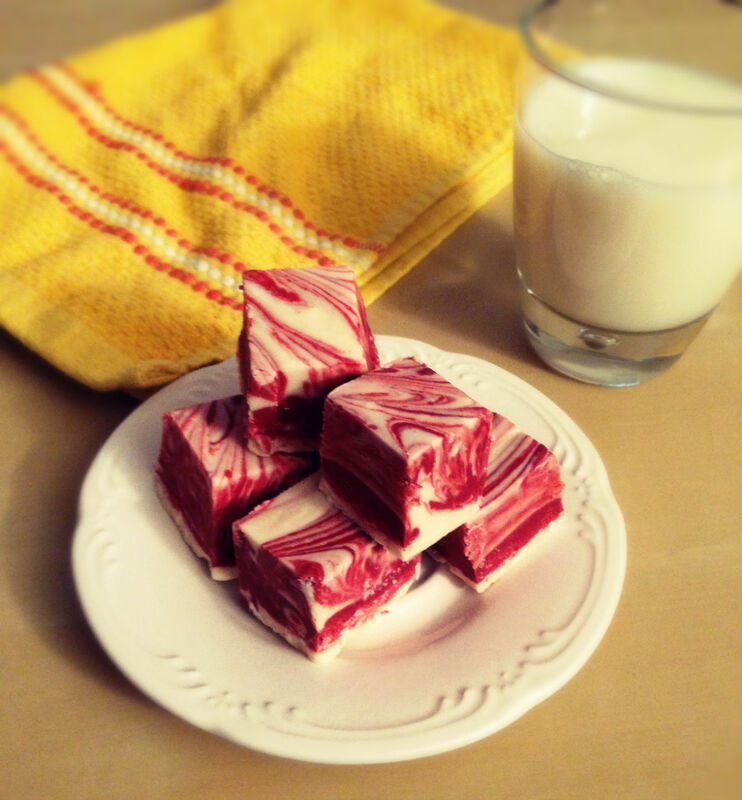 I’ve been wanting to make fudge for awhile now though, and it turned out splendidly! The red and white swirl effect gave it that Valentine’s Day theme I was hoping for and the judges agreed! The S’mores Cupcakes were the same recipe I made last fall that my whole family cheated on their diets for. I changed up the colors, making the marshmallow cream cheese filling pink, and the graham cracker buttercream red. I even went on a hunt for pink heart marshmallows and was ecstatic when I actually found them! They were a nice little touch, I thought. And it even kept with the s’mores theme, too! 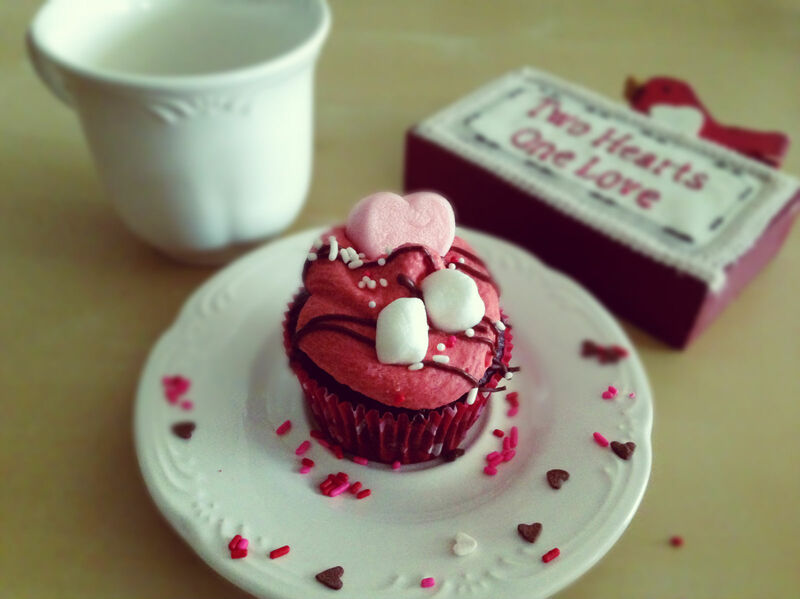 And then, for fun, I added some V-Day sprinkles of various kinds. All in all, it made a delicious Valentine’s treat, also suitable for a campfire, or a random Tuesday night. 🙂 Let’s finish up with a picture or two, so I can get to writing the fudge post! Chocolate. Marshmallows. Graham crackers. What’s not to love, right? There are few things in life more perfect than sitting around a campfire with friends and/or family, roasting marshmallows, then squishing them between graham crackers and chocolate, taking a bite and giggling uncontrollably as the s’mores innards ooze down your face. It’s one of life’s simple pleasures, and an activity I can enjoy pretty much year-round (flashback to many happy memories of roasting marshmallows in my fireplace with my family on a cold winter’s night). Personally, I’ve never even needed the graham crackers or chocolate; just gimme a stick, a marshmallow, and a campfire, and I’m one happy little camper (pun intended). 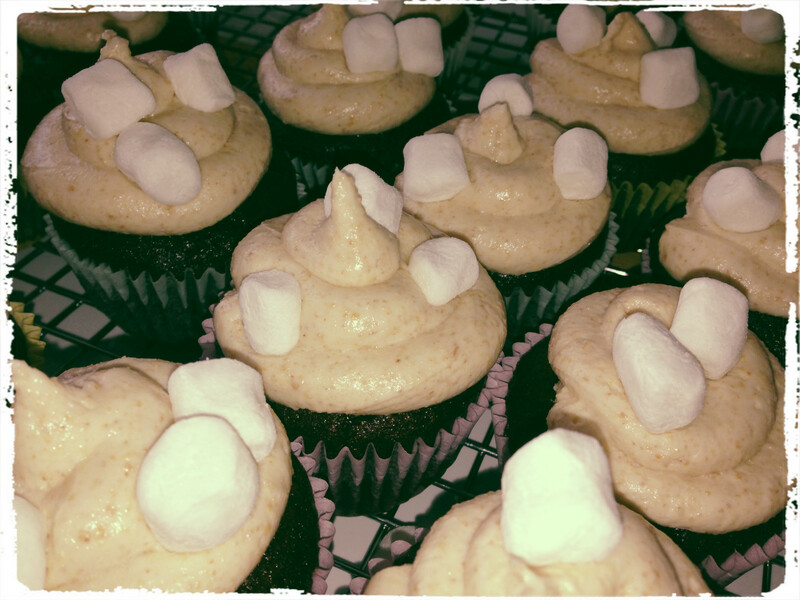 So, when I came across this s’mores cupcake recipe, I was intrigued. And I wanted it. Immediately. Luckily, with the weekend right around the corner and no recipe in the queue, it took me only a few days to make this dream a reality. And let me tell you – I needed to be pinched to ensure I wasn’t still dreaming when I bit into these little morsels of perfection.